Mikio Ikemoto, the manga artist who assisted Masashi Kishimoto throughout the “NARUTO” series and which is now leading the monthly series “BORUTO – NARUTO NEXT GENERATIONS,” on Weekly Shonen Jump, directly answers our questions!! ― First of all, please briefly tell us how “BORUTO – NARUTO NEXT GENERATIONS –” materialized as a series. Ikemoto: Boruto, along with Sarada and many other characters, first appeared in “BORUTO - NARUTO THE MOVIE -,” which was the final theatrical installment of NARUTO series. As the movie featured a number of intriguing characters, many fans voiced their wish to watch its sequel. However, Mr. Kishimoto did not intend to write more stories about Boruto and his friends, so he suggested that I do the sequel. ― So far in the series, which scene was the most important to you, personally? Ikemoto: The scene is actually in the movie. 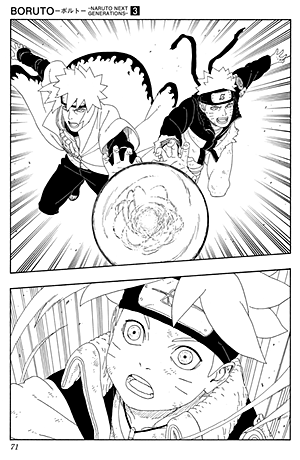 There was a scene in the 9th episode where Boruto creates a gigantic Rasengan together with Naruto. I was in sync with Boruto when drawing the sketch, as I felt the weight of NARUTO series and its long history behind it. ― Are you always emotionally attached to characters when you are drawing them? Ikemoto: Well, I suppose so. Most of the time, I am closely attached to each character I am drawing. In that sense, it is easier for me to empathize with Sarada, Kawaki and main characters other than the protagonist. Because Boruto’s actions are pretty much predetermined in the storyline, there are many restrictions in his depictions. On the other hand, I have more freedom with other characters, so they are easier to depict. Ikemoto: Well, I suppose so. Most of the time, I am closely attached to each character I am drawing. In that sense, it is easier for me to empathize with Sarada, Kawaki and main characters other than the protagonist. ― The costumes and other designs in NARUTO and BORUTO are quite unique. Where do the ideas for character designs come from? Ikemoto: For each character, the role and personality are determined first, and I draft its rough design based on my personal impression. Then, I check other existing characters in NARUTO series to avoid design overlap. I introduce new characters only after I know there is no duplication problem. ― Does it mean you just visualize your impression as character designs instead of referring to some specific sources? Ikemoto: Yes. My character designs directly reflect my first impressions. When I was an assistant for NARUTO series, Mr. Kishimoto asked me to create designs for some characters. So, I think I have enough training and experience to design new characters for the series. ― Is there any particular area in drawing and designing where you pay close attention to? 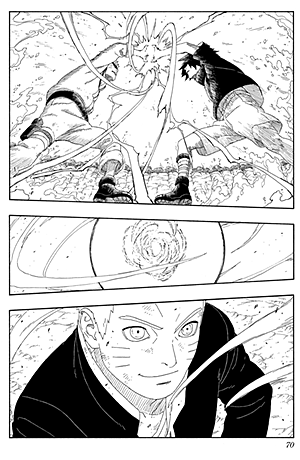 Ikemoto: I always try to avoid drawing something too original by closely aligning my style with the original NARUTO and BORUTO. Mr. Kishimoto often tells me to make “eyes and mouths large,” as smaller eyes and mouths leave characters spiritless. 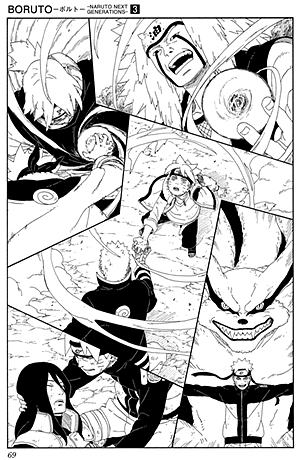 Also, I am careful when depicting Boruto interacting with other characters, as they often tend to affect my style. For example, when Boruto interacts with Tento, a character introduced in the 11th episode, there are so many scenes where Boruto exposes childish emotions that the drawing becomes slightly childish as well. 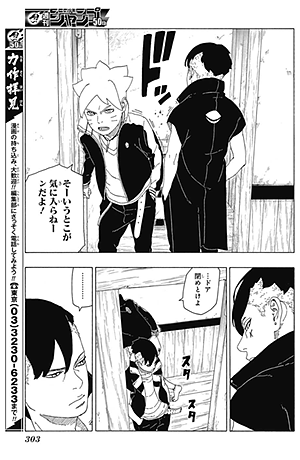 After Kawaki joined the story, Boruto started to look overgrown sometimes, because Boruto turns visibly rebellious in the presence of Kawaki. Such fluctuations in my expressions are where I need to tackle in the future. ― Have you ever met fans of BORUTO outside Japan? Ikemoto: Last year, I had the opportunity to interact with fans at Lucca Comics & Games in Italy. It was a signing event, and because the admission was determined by raffle, many fans could not enter the venue. There was a little boy among those unlucky fans, and he burst into tears and said, “Why can’t we go in? !” I was so sorry for him but at the same time was delighted, knowing someone loves BORUTO with such a passion. Also, after an interview session in a large event hall, a group of fans approached me and said, “There is something we want to present you.” It was an illustration literally featuring all BORUTO characters who ever made an appearance in the series. Even the nameless ones were featured, drawn in tiny corners. There was a level of enthusiasm I have never felt before. I was deeply moved and felt sincerely grateful. ― Are there any highlights in BORUTO that you would particularly like to recommend to overseas fans? Ikemoto: As for the future development of the story, it will revolve around Kawaki, so I don’t want fans to miss it. I want them to watch how the chemistry between Kawaki and Boruto transforms, and how it links back to the opening scene of the 1st episode. Also, my brushwork in BORUTO is slightly more realistic than that of NARUTO, so you might enjoy somewhat more intensive depictions of characters, background buildings and sceneries. 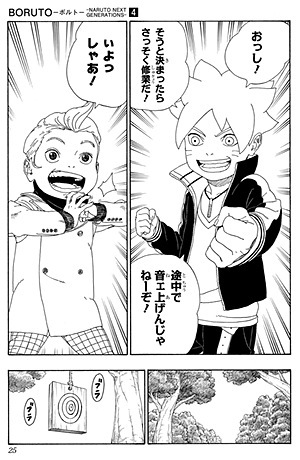 ― Do you have any set goal in running BORUTO series in the future? Ikemoto: My utmost priority is to complete the entire story for BORUTO. That said, I do not want the story to sprawl out too much. As the original NARUTO series already has a whopping 72 volumes, I am hoping to complete the story within 30 volumes to keep the entire saga within a hundred volumes altogether. ― Finally, can you offer a message to the readers of this article? Ikemoto: You can read so many manga for free on MANGA PLUS, so please indulge! If you enjoy BORUTO please considering picking up the printed version as well!